The search for signs of life on Mars has been a little frustrating at times. The discovery that there was water (and probably lots of it) on Mar’s surface in the not too-distant past, and signs of methane, have all suggested that the conditions for life were present during Mar’s past. However, the actual discovery of life has so far eluded the NASA probes that have been sent there to search for it. The problem is that the current surface of Mars is too sterile. Without an atmosphere or reserves of water, any life, or the organic remnants of life, on the surface would be exposed to extreme temperature swings and cosmic radiation – neither of which are ideal for maintaining a record of organic material. Recently, NASA has been investigating recent impact craters on Mar’s surface to see if there may be any indication of life in these areas. When a object strikes a planet, the force and heat of the impact may produce glass, and it is possible that this process may trap signatures of life. The green areas in the photo below (Alga Crater) are glass deposits produced by a meteor impact. 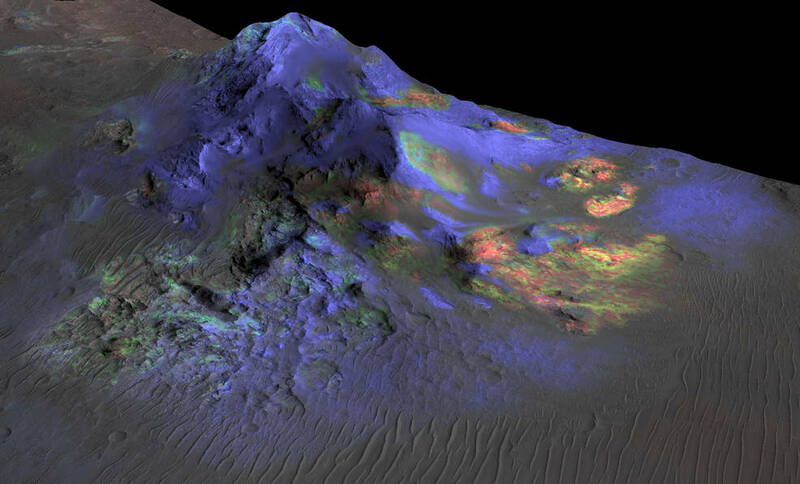 While scientists are not stating that they will definitely find evidence of life in these glass deposits, they are beginning to map the locations of the impact glass deposits for possible recovery or study by future missions.